The apples, chilgoza and other dry fruits are grown here are world famous. The high terrain here give way to great adventures sports of all kinds. Beautiful trekking routes includes the ‘Parikarma of Kinner Kailash’. Here is also the Beautiful Nako lake and three famous wild life sanctuaries. Kalpa is a small village at a height of 2960m in Kinnaur district of Himachal Pradesh. This place is at a distance of 230 Km from Shimla and at 13 Km from Reckong-Peo the district headquarter of Kinner district. This place is well connected by road only. It is recommended to stay minimum of two nights at Kalpa. Usually tourist arrive late afternoon from distance places like Simla , Sarahan or Sangla so next day stay can give you full day beauty of the majestic Kinner Kailash hills. From Kalpa we can get views of three peaks Roldang 5499m, Jarkanden ( 6473m) and the Kinner Kailash at 6050 m height. Kalpa village is a small village with almost all facilities like post office, hospital, shops and small restaurants. These restaurants are offering Indian and Chinese foods for the tourists. There are many small guest houses inside the village offering rooms. Main attraction is Narayan-Nagini temple and Hu-Bu-Lan-Kar monastery. This monastery was founded by Rinchensang-po ( 950-1055 AD ). Walk along the narrow lanes of this village upto the temple and you will get a good glimpse of Kinnor culture and its color full villagers. Village is surrounded by apple trees and at one side the view of snow peaks makes this village the main attraction of tourists coming to Kalpa. From your hotel you have to use steps to reach the village but take care that you have to climb up again to return so conserve your energy. The steps pass through apple garden and reach the village. If you are scared of climbing up then you can use your vehicle as road is there up to the village end. A casual visit to this village will take one hour minimum from your hotel if you visit temple and monastery only. As sun rises from behind the Jarkanden Peaks so photography of hills during morning time is not possible , however you can take photos as the sun comes out of the peaks and light falls on the valley. Around 11 AM as the sun climbs up and direct sun light starts falling on the peaks and gives beautiful view for the tourists to capture in their cameras. Suicide PointWithin 10 minutes drive from Kalpa village through apple gardens this place is known for its vertical slope and dangers ditch. Roghi Village Beyond Suicide point after 5 minutes drive there is Roghi village. Like other village this village has also one temple and apple gardens are there surround the village. Here also villagers main business is Apple cultivation. Airtel mobile signal is available at Kalpa along with BSNL which works in remote parts of Himachal Pradesh. We left Sarahan at 8.10 AM and reached Kalpa at 1.15 PM. The road to Kalpa is on NH22 (from Shimla ) upto Reckong Peo except last 27 KM. Most of the time Sutlej river will be at your left side and the road passes through many hydroelectric projects and dams under construction. After 45 minutes from Zeori we enter into Kinner district. On the way we crossed Tapri town and the reached Rockong Peo the district headquarter of Kinnor district. After Reckong Peo we climbed another hill through hair pin bend curve road. On both side of the road there are many apple gardens full with apples. Mostly the apples are Red in color but another variety of apple gives golden color. These golden color apples are the best in taste. You are welcome to take photos by standing below the trees but plucking of fruits is not allowed. The best hotel to stay is Himchal Tourism Development Corporation Hotel. The name is Hotel Kinner Kailash. You need to book in advance to get accommodation here. There are different ranges of rooms available here starting from 1000 to Rs 4000. The number of rooms are very less so you need to book in advance through internet or by calling HPTDC office by phone. For detail HPTDC hotel booking procedure read here This beautifully designed hotel has glass windows opening towards Kinner Kailash snow peaks, the restaurant located at second floor offers panoramic view of surrounding hills and valleys. This hotel closes during October -November and reopens in April month because of snow fall. The district headquarter shifted to Reckong Peo as road to Kalpa gets blocked due to snow fall in winter. One of the main attraction of Kalpa is the view of peaks, the most popular one is Kinner Kailash Peak at a height of 6050 m. There is a free-standing seventy-nine foot high rock ( in the shape of ShivaLinga ) This sacred shivlinga changes its color during the day with change in color of the sun light. From Klapa this Shivlinga is visible and is one of the main attraction of tourists. To reach the peak one has to join a trekking group for three days. To do a parikrama ( circumambulation ) going around the base mountain will take seven to eight days, this trek starts from Moorang. While traveling from Shimla on NH 22 you need to take right side diversion at Karcham. From Karcham Sangla is 18 KM. While traveling from Karcham to Sangla the river Baspa will be at your right side and the same road continues after Sangla till Chitkul the last village inside India before the Indo – Tibet border. Chitkul is at a height of 3450 Meter. This is the last village of India to the side of Tibet border and this beautiful village si also by the side of Baspa river. This village is located at a distance of 28 KM from Sangla. Tourist stay at Sangla and go for half day trip to Chitkul. It will take one hour to reach Chitkul from Sangla and you can plan for one or two hour stay there and return. So, if you are starting at 9 AM from Sangla, then you can return before 2 PM to Sangla. Now there are hotels and guest houses available at Chitkul also to stay. While traveling to Chitkul valley, river Baspa will be at your right side. On the way you will pass through Rakcham village. There are several camp sites located within the apple gardens by the side of Baspa River. 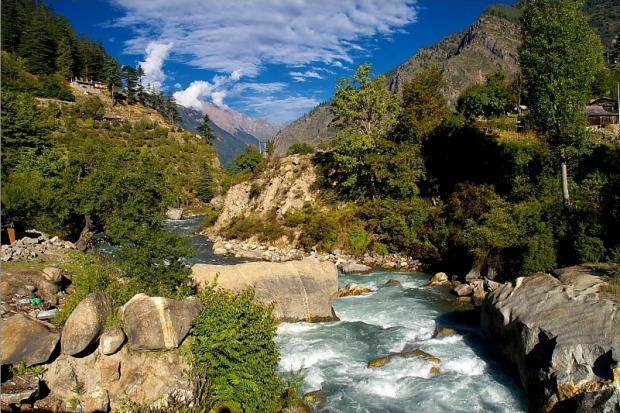 This river will be at your right side while travelling towards Sangla and Chitkul. Sanglavillage is located by the side of this river. From the parking area you have to go down a bit to reach the river bed. It is better to walk a bit towards the village end and then walk down to river as you can avoid the stiff inclination of the steps. Baspa river joins Sutlej river at Karcham 28 Km from Sangla. Go for a walk inside the last inhabited village of India before the border. There is a temple of goddess Mathi at the center of the village. Total population of the village is around 700. Wheat fields are there around the plane areas surrounding the village. When we visited, villagers were busy in cutting the wheat cultivation and transporting them back to the village. This is a small and beautiful village located in Spiti district of Himachal Pradesh. This village remains cutoff from Shimla district due to snow fall in winter seasons. Tourists start coming here once the roads are opened from Reckong Peo. Peo remains open throughout the year. Being in a border, inner line permit is required for foreigners to enter into Nako. By the side of the village there is a lake known as Nako Lake. Like other villages of this area there is a Monastery at the center of the village. You can go for a walk to visit the Nako lake and the village after reaching Nako. The road passes through narrow lanes of the village and connects to main road. There are many hotels and guest houses in this village, some of them are constructed in traditional way with local materials, they are popularly known as Home stay. Price of these home stay guest houses are less and available at a range of INR 350 /- per day. Normal guest houses are available at a price of INR 750/- . Extra bed are at a range of INR 100 to 150/-. Room rent may vary. These tents are promoted on Eco tourism concept. Tents are having all basic facilities with attached toilet but without TV facility. In Nako even good hotels does not have TV facility inside rooms. Many foreign tourists visit Nako and go for trekking around this place. This entry was posted in Beauty of Himachal Pradesh Kinnaur, Beauty of Kinnaur Himachal Pradesh, Hotel in Rakcham Sangla Valley, Kalpa Himachal Pradesh Images, Packages for himachal, Picture Gallery Himachal Pradesh by Hotel Apple Pie, Uncategorized. Bookmark the permalink.